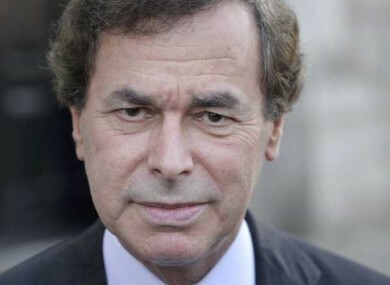 JUSTICE MINISTER ALAN Shatter has told the Dáil that the new legislation to establish a DNA database in Ireland strikes the right balance between tackling crime and respecting individuals’ human rights. Introducing the Criminal Justice Forensic Evidence and DNA Database System Bill in the Dáil today, Shatter said that the bill is, in his view, the most important to be introduced in the lifetime of this government in helping gardaí to fight crime. Perpetrators of most crimes involving a sexual offence will also have their details placed on the database, regardless of the sentence. Shatter said today: “The Bill not only provides for the establishment of a DNA database to assist Gardaí in the investigation of serious crime but also will assist in finding and identifying missing or unknown persons. He said it would also be of assistance in cases where there has been a miscarriage of justice and would help gardaí “for decades to come”. He said that despite budget constraints once the bill is enacted the Forensic Science Laboratory will have the specialist staff in place and be in a position to purchase and install “sophisticated robotic sample handling instruments” to cater for the increased number of DNA samples it will deal with. Shatter said that his legislation is an improvement on that introduced by his predecessor in 2010 and has addressed issues concerning the retention of samples and DNA profiles of persons who are not subsequently convicted. Fianna Fáil’s justice spokesperson Niall Collins welcomed the bill and said it is “an important step forward in the battle against serious crime”. Collins also said that the legislation needed to “uphold the highest standards of human rights which we have set ourselves”. Sinn Féin’s Pádraig Mac Lochlainn said that he welcomed “the broad thrust of the bill” but raised concerns about a section of the bill which provided for taking DNA samples from “some former offenders who are no longer subject to sentence”. He raised concerns as to whether this may be contrary to the Good Friday Agreement. Email “Shatter: DNA database strikes balance between tackling crime and respecting human rights”. Feedback on “Shatter: DNA database strikes balance between tackling crime and respecting human rights”.